Noach Cafe is proud to offer a unique program with special benefits at our cafe, specifically designed with you, our most loyal guests in mind. It’s our way of saying “Thank You” for your loyal patronage. 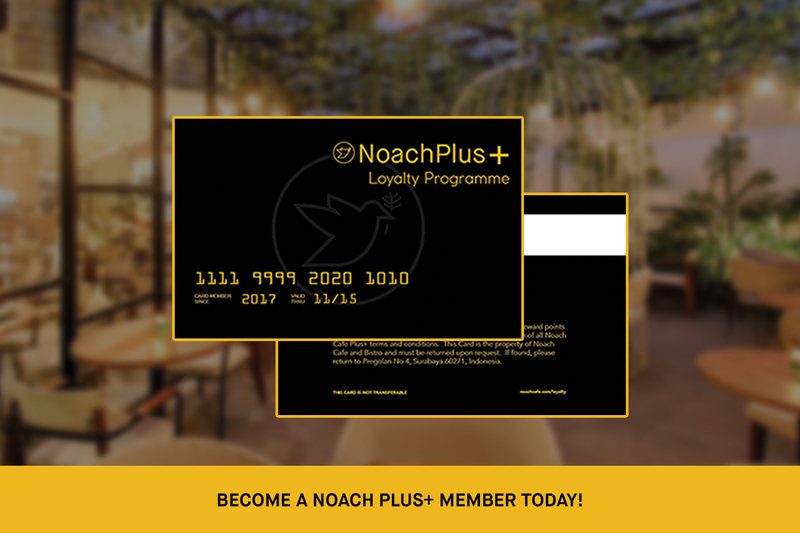 To recognize your loyalty, we invite you to join our Noach Plus+ Loyalty Program. The Noach Plus+ program is free to join, and we will award you 20 points as a bonus for your registration! Sign up today! Once you have enough points to redeem you can choose the number of points you’d like to redeem on your purchase during the checkout process. There is no limit on the amount of Points redeemable, however points cannot be combined with discounts or promotional codes. As a Noach Plus+ member, you’re entitle to a 10% discount off on our Special Menu for Loyalty Members Only.